Aircraft maintenance, repair and overhaul company HAECO has a row of enormous hangars in a generally out-of-the way commercial corner of the city, tucked on the edge of the Piedmont Triad International Airport. On a recent rainy Friday morning, Hangar 4 was bustling with maintenance crews refurbishing a fleet of commercial airplanes, which had recently been transferred to a new carrier as part of an acquisition. Crew members in coveralls and safety gear were ripping out the old interiors and dressing the planes for their new gig. Kandise Neufville, 41, is the lady whose job it is to fill this hangar with staff. 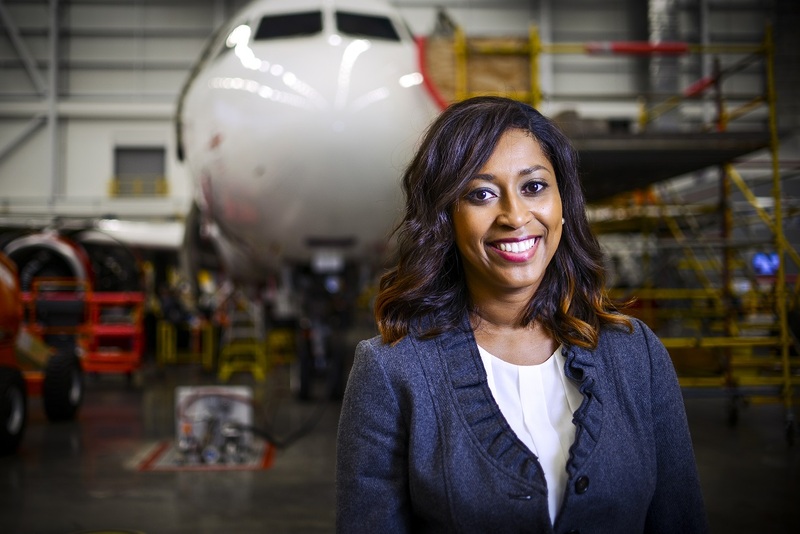 She’s director of talent acquisition for HAECO Americas (formerly TIMCO), part of the international HAECO Group, one of the largest businesses providing aircraft maintenance services in the world. 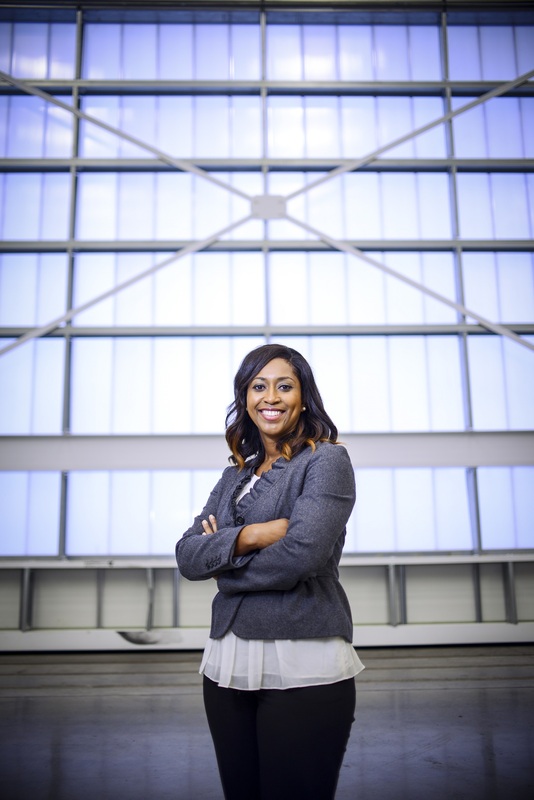 Kandise and her team are out there, traveling around the country to find the best people to fill openings for good aviation jobs for the company, which has 1,200 employees in Greensboro alone. It’s a booming industry, and that means Kandise has to find creative ways to bring in talented employees – like being part of Guilford Apprenticeship Partners (GAPNC), a program connecting local high schoolers with jobs. Kandise grew up in Lumberton and Winston-Salem and studied management information systems at Winston-Salem State University. She quickly realized she didn’t want a job sitting behind a computer all day. After a job as a grant administrator at Wake Forrest University, she switched to a more people focused job in human resources. “I’m a chatty Kathy. I like talking to people about everything and anything. I meet people and I learn new things every day,” she says. 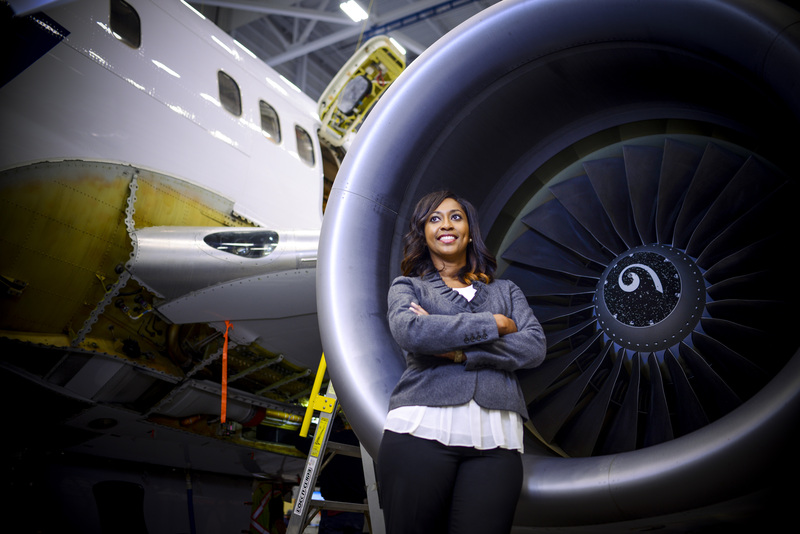 She first got into the aerospace industry working for B/E Aerospace in Winston-Salem. She moved to HAECO about three years ago. “It’s an industry that is going to continue to grow and innovate,” Kandise says. About eight months out of the year, Kandise and her team is on the road traveling to college campuses and recruiting people to move to Greensboro. She’s looking for people who are highly trained for this job. She also hires people who are new to the industry, but are mechanically inclined, to join a trainee program. They’ll go to GTCC to become fully certified. HAECO recently joined GAPNC, a local workforce initiative to bridge the gap between high school and high-tech fields like cybersecurity, advanced manufacturing and aviation. Partner businesses, like Brady Trane and Machine Specialties, take on high school juniors and seniors as apprentices before they graduate. After high school, they get a job at the business as well as assistance paying for the continuing education they need. HAECO’s first apprenticeship will be focus on machining. The student will go to GTCC and get paid to work at HAECO simultaneously. “We will pay for their books, tuition, and everything. They will end up with an Associate’s degree, and a skilled trade,” Kandise says. There is a shortage of mechanics for their industry, Kandise says. Programs like this will help fill that need. “We need the younger generation to come in. We need to close that skills gap,” she said.